Friday and the weekend looks set to be warm in most areas with a mix of cloud and sunshine. THE WEATHER IS set to improve for the weekend ahead with highs of 26 degrees. It has been a mixed bag over the past few days with plenty of rain after drought conditions in previous weeks. According to Met Éireann, the coming days look set to stay mixed with rain and drizzle forecast. Today will be breezy and cloudy with rain in the west spreading across the country this morning but becoming drier again later in the day. Tomorrow rain and drizzle will gradually spread across the country and there will also be mist and fog on west and south coasts. 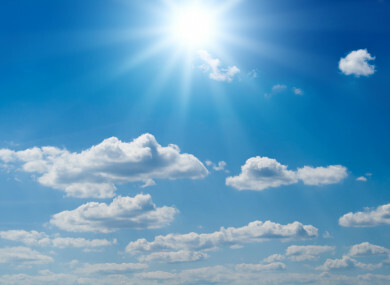 On Thursday there will still be a few spells of rain and drizzle, but Met Éireann says that current indications suggest clearer sunnier conditions will develop later in the day with maximum temperatures of 25 degrees. Daytime highs of 26 degrees are forecast but even though a lot of dry weather is indicated, showers are still possible. Email “Rain and drizzle in days ahead but highs of 26 for the weekend ”. Feedback on “Rain and drizzle in days ahead but highs of 26 for the weekend ”.